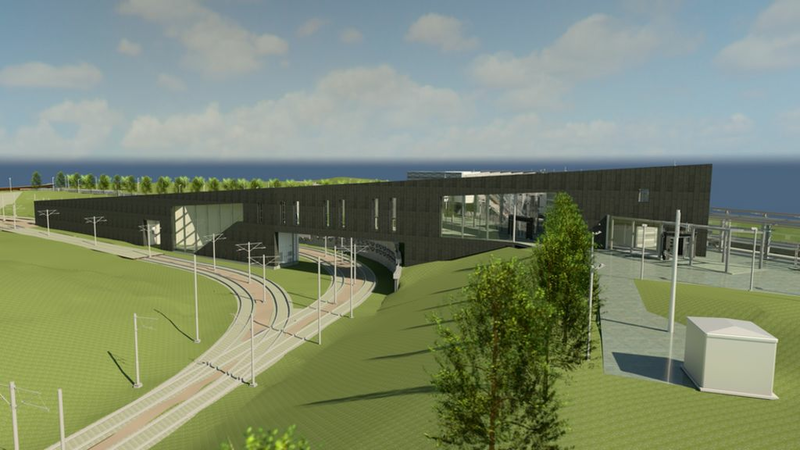 Edinburgh's newest railway station is on schedule to open by the end of the year, Network Rail has said. The 'Edinburgh Gateway' has been designed to allow rail passengers travelling from the north to reach the city's airport more easily. An interchange will allow them to complete their journey to the terminal building by tram. The £41m station is being built next to the Gogar roundabout on the A8 and will also have a link to the Gyle Centre. The station is part of the Edinburgh-Glasgow Improvement Programme, which will see the electrification of railway lines in central Scotland. Edinburgh's newest railway station is on schedule to open by the end of the year, Network Rail has said. View over part of the construction site which will become the new Edinburgh Gateway interchange on 11 November 2015, seen from the down side of the line. The 0941 Inverness - Edinburgh is about to run south through the platforms while in the background the 1300 Edinburgh - Dundee is heading for the Forth Bridge. The new structure at Edinburgh Gateway rises. This is the construction site as viewed from a tram.